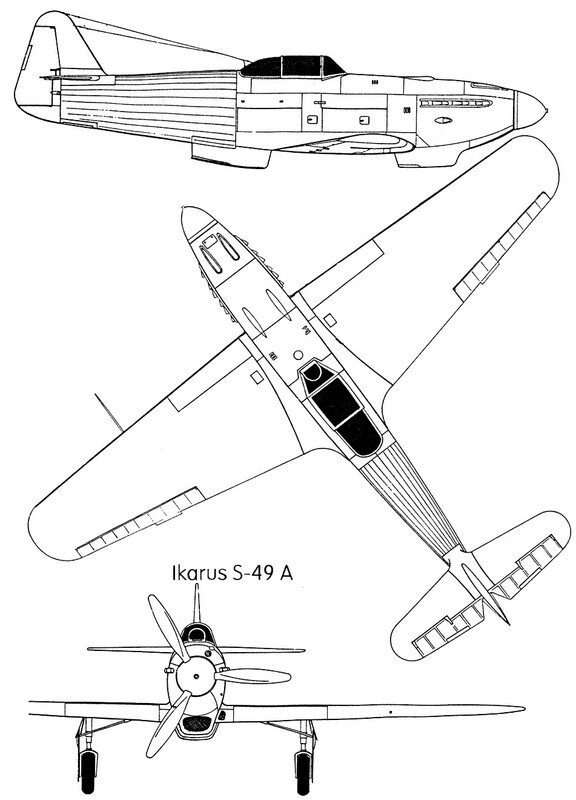 The first postwar fighter to be designed in Yugoslavia, the S- 49 was a development of the prewar Ikarus IK-3, production of which had been halted by the German invasion after only a few evaluation aircraft had been completed. The prototype flew in 1948, powered by a Klimov VK-105PF-2 liquid-cooled engine, and the first examples entered service as the S-49A in 1951. Subsequent aircraft were powered by the Hispano-Suiza 12Z-11Y engine, purchased after Yugoslavia severed relations with the USSR. In this guise, and with other refinements, the aircraft emerged as the S-49C. The Ikarus S-49 was a Yugoslav single-seat, single-engine fighter aircraft built for the Yugoslav Air Force (Serbo-Croatian: Ratno vazduhoplovstvo i protivvazdušna obrana – RV i PVO) shortly after World War II. Following the Tito–Stalin Split in 1948, the RV i PVO was left with an aircraft inventory consisting of mostly Soviet aircraft. Unable to acquire new aircraft or spare parts for its existing fleet, the RV i PVO turned to its domestic aviation industry in order to create an indigenous design to fulfill the need for additional aircraft. 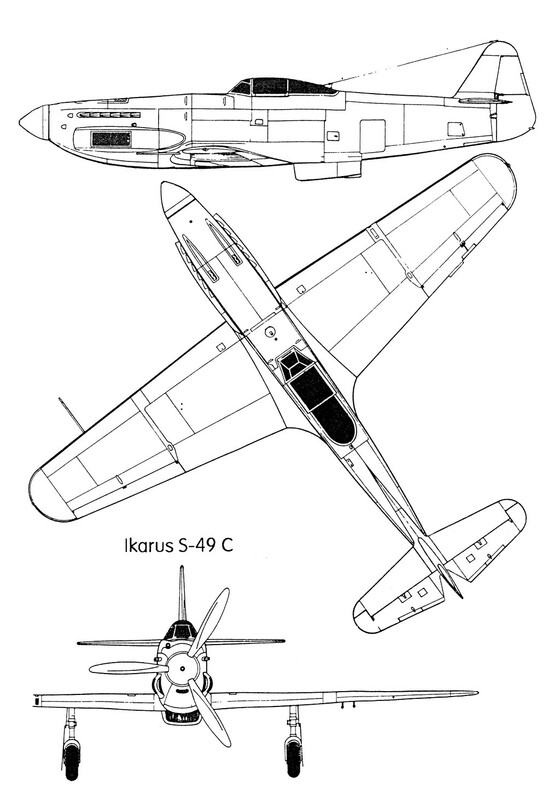 The same constructors that built the Rogozarski IK-3 before the war, engineers Kosta Sivcev, Slobodan Zrnic and Svetozar Popovic, used existing technical documentation of the IK-3 to construct the new fighter aircraft, the Ikarus S-49. The S-49A was of mixed construction, with Soviet-built VK-105 engines held in stock, which were no longer available after 1948. Therefore, it was decided to produce a new version of the aircraft powered by the similar French Hispano-Suiza 12Z-17 engine. Because of the bigger and heavier engine, the new aircraft had to be of all-metal construction with a much longer nose. While the aircraft were mainly built by Ikarus, the wings and tail were built by the SOKO factory in Mostar. The armament consisted of one 20 mm Mauser MG-151/20 autocannon produced by Germany during World War II and two 12.7 mm Colt-Browning machine guns. In addition, underwing racks for two 50 kg bombs or four 127 mm HVAR missiles were provided. The first prototype of the S-49A flew in June 1949. The first operational aircraft were delivered to combat units at the beginning of 1950. An S-49B Ikarus had been proposed with the German DB-605 engine, but for mass production the Ikarus S-49C was chosen. The S-49A was superseded by the improved S-49C, featuring an all-metal construction and a more powerful engine. The Ikarus S-49C went into service with the units of the Yugoslav Air Force at the beginning of 1952. The aircraft factory “Soko” produced the assembly of the wing and empennage for the S-49C fighter, starting in 1952. An all-metal version of the S-49A powered by a Hispano Suiza HS 12Z-17. Underwing mounts were fitted for rockets, MG-151 or Colt-Browning M2 12.7- mm machine guns, or two 50-kg bombs. A total of 45 S-49A and 113 S-49C were produced by the Ikarus Aircraft Factory in Zemun. The last aircraft were retired from RV i PVO service in 1960/61, having been replaced by more modern jet-powered aircraft. S-49B – planned version powered by a Daimler-Benz engine; unbuilt.